It looks like The Witcher 2: Assassins of Kings will be coming to consoles after all, if a Google translation of a German report of a Polish television interview is to be believed. 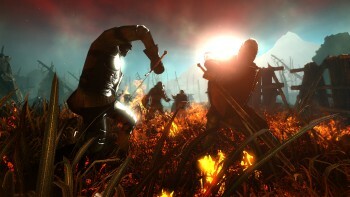 It's hard to say that speculation about a console version of The Witcher 2 has been running rampant - this isn't L.A. Noire we're talking about, after all - but it has been a topic of casual conversation among fans of the surprisingly popular RPG franchise created by Polish studio CD Projekt Red. A planned console release of the original Witcher entitled Rise of the White Wolf collapsed in 2009 and since then the studio has shown no great interest in straying off the ranch, but in a recent interview on Polish television, CD Projekt co-founder Michal Kicinski said the game is in fact coming to the Xbox 360 and PlayStation 3, and won't actually be very far behind the PC release. So it seems, anyway; bear in mind that the original statement was made on a television show which was then reported by a Polish gaming site, re-reported by a German site and then translated by Google. At best, it's a clunky interpretation of Kicinski's words; at worst, it's all a big, fat, heavily-accented lie. "Yes, it is for us a completely new project, but of course we are already working on it," Kicinski allegedly said, sort of, when asked if the game will be released on consoles. "You can assume that we [will tell] you during major events such as E3 and the Gamescom [and will] be informed about this further." That's obviously a little rough around the edge and CD Projekt isn't being particularly helpful with details. "We'd love to bring The Witcher to consoles," said CDP PR VP Tom Ohle, "but have not announced any such plans." The report claims that CD Projekt Red is focused on the PC release of The Witcher 2 and that the console version will lag about three or four months behind, so we won't have to wait too terribly long to find out if this is true. In the meantime, CD Projekt did confirm today that the game has gone gold; The Witcher 2: Assassins of Kings comes out on May 17, exclusively (so far) for the PC.